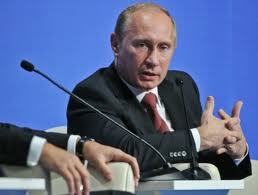 Vladimir Putin, Prime Minister of Russia, is giving us a great negotiation tell here. When people have their hands clasped in front of them during a meeting, discussion or negotiation it generally is an indication of some level of blocking and a closed-off mindset. They may also be attempting to appear reserved and relaxed. This is not a natural position of relaxation though. Notice Mr. Putin's hands are lifted off the table. At this same time his thumbs are elevated. This is the equivalent of a shrug. We cannot see the dynamics of this particular moment since this is a still image and not a video, but very often a shrug will come in this abbreviated disguise - and the words may very well not be congruent with the emotional tone of a shrug. In these cases, the hands and the thumbs are only briefly elevated, for a second or two and the shoulders may never elevate. Thus, this gesture can be thought of as partial emblematic slip (Ekman) when it is in disparity with what is said verbally. Notice also that Mr. Putin is speaking out the side of his mouth. Although this is baseline behavior for a very small minority of people - it is a strong signal of insincere behavior or dishonesty. In linguistics, a homonym is a word/set of words which although spelled and pronounced the same, has different meanings. I can say, "That lady is hot", or "It's rather hot outside" or "Wow, this pepper is hot!" The science of Body Language also has Nonverbal Homonyms. The thumbs up gesture, in what at first glance, may appear to be identical to the scenario in the above photo - can mean something completely different depending on what other body language signals and particulars with which it is clustered. Ignore this distinction at your peril.